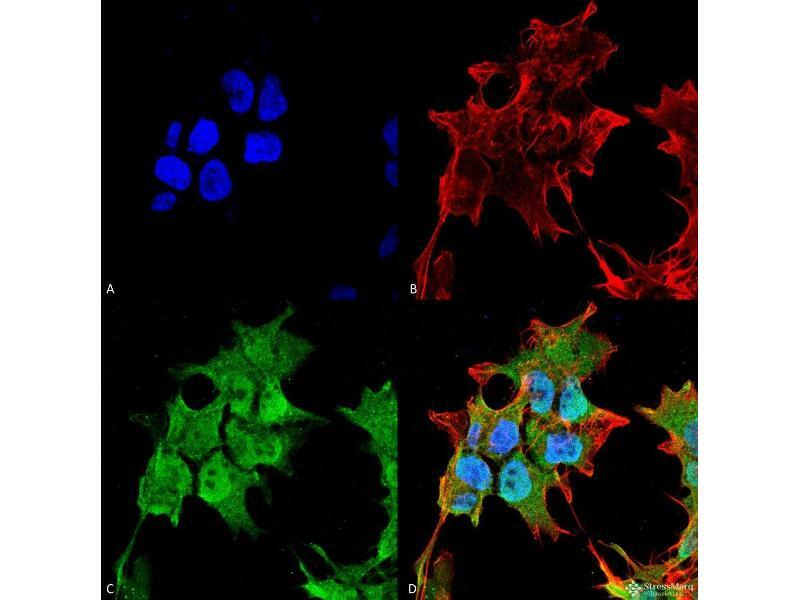 Immunocytochemistry/Immunofluorescence analysis using Mouse Anti-SUR1 Monoclonal Antibody, Clone S289-16 . Tissue: Neuroblastoma cell line (SK-N-BE). Species: Human. Fixation: 4% Formaldehyde for 15 min at RT. 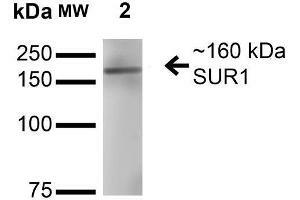 Primary Antibody: Mouse Anti-SUR1 Monoclonal Antibody at 1:100 for 60 min at RT. Secondary Antibody: Goat Anti-Mouse ATTO 488 at 1:100 for 60 min at RT. Counterstain: Phalloidin Texas Red F-Actin stain; DAPI (blue) nuclear stain at 1:1000, 1:5000 for 60min RT, 5min RT. Localization: Cytoplasm, Nucleus. Magnification: 60X. 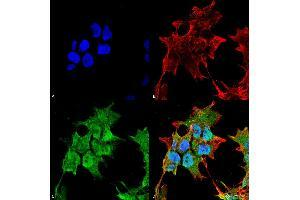 (A) DAPI (blue) nuclear stain (B) Phalloidin Texas Red F-Actin stain (C) SUR1 Antibody (D) Composite. Western Blot analysis of Rat Brain Membrane showing detection of ~160 kDa SUR1 protein using Mouse Anti-SUR1 Monoclonal Antibody, Clone S289-16 . Lane 1: Molecular Weight Ladder. Lane 2: Rat Brain Membrane. Load: 15 µg. Block: 2% BSA and 2% Skim Milk in 1X TBST. 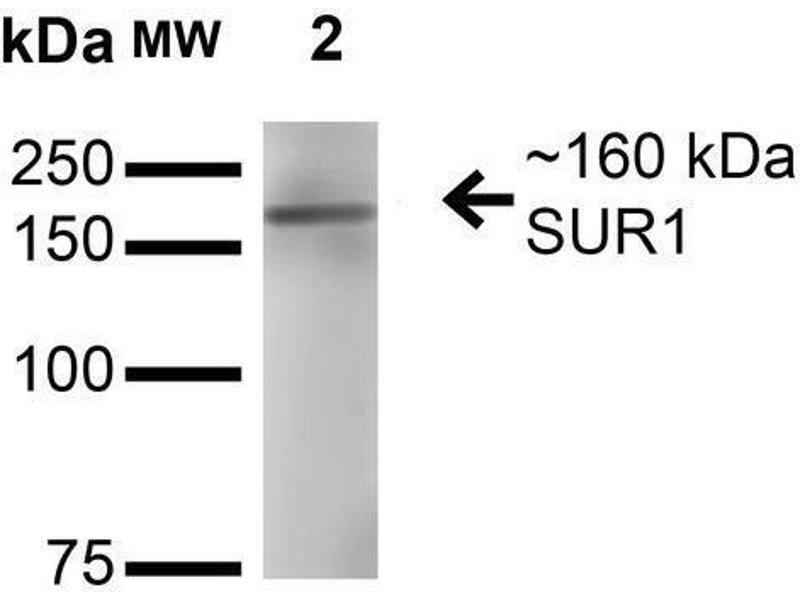 Primary Antibody: Mouse Anti-SUR1 Monoclonal Antibody at 1:200 for 16 hours at 4°C. Secondary Antibody: Goat Anti-Mouse IgG: HRP at 1:1000 for 1 hour RT. Color Development: ECL solution for 6 min in RT. Predicted/Observed Size: ~160 kDa. Specificity Detects ~160 kDa. Does not cross-react with SUR2B. Background Sulfonylurea receptors (SUR) are membrane proteins which are the molecular targets of the sulfonylurea class of anti-diabetic drugs whose mechanism of action is to promote insulin release from pancreatic beta cells. More specifically, SUR proteins are subunits of the inward-rectifier potassium ion channels Kir6.x (6.1 and 6.2) (1). The association of four Kir6.x and four SUR subunits form an ion conducting channel commonly referred to as the KATP channel. The primary function of the sulfonylurea receptor is to sense intracellular levels of the nucleotides ATP and ADP and in response facilitate the open or closing its associated Kir6.x potassium channel. Hence the KATP channel monitors the energy balance within the cell (2). 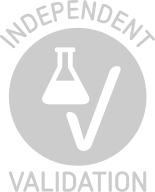 optimal dilutions for assays should be determined by the user. 1 μg/ml of SMC-409 was sufficient for detection of SUR1 in 20 μg of mouse brain membrane lysate and assayed by colorimetric immunoblot analysis using goat anti-mouse IgG:HRP as the secondary antibody. Background publications Nichols: "KATP channels as molecular sensors of cellular metabolism." in: Nature, Vol. 440, Issue 7083, pp. 470-6, 2006 (PubMed). Campbell, Sansom, Ashcroft: "Potassium channel regulation." in: EMBO reports, Vol. 4, Issue 11, pp. 1038-42, 2003 (PubMed).